Funded by the European GNSS Agency (GSA) under Horizon 2020, the H2H system will combine sensor information with 3D models to create digital models of vessels and other objects of interest. This digital model can be visualized by the mariner in 3D, or in 2D format using slices of the 3D model, and used to derive crucial navigation information in real time. The quality of the sensors and the 3D model will drive the quality of the digital model, and consequently the quality of the navigation information that is derived from the model. The H2H approach will allow mariners to establish proximity zones for their own vessels and for neighbouring objects with a high level of precision and integrity. Other examples of navigation information that will be derived from the model include the shortest distances and relative speeds between vessels and other objects. Autonomous vessels may need, depending on the operation, the assurance of decimetre-level accuracy. 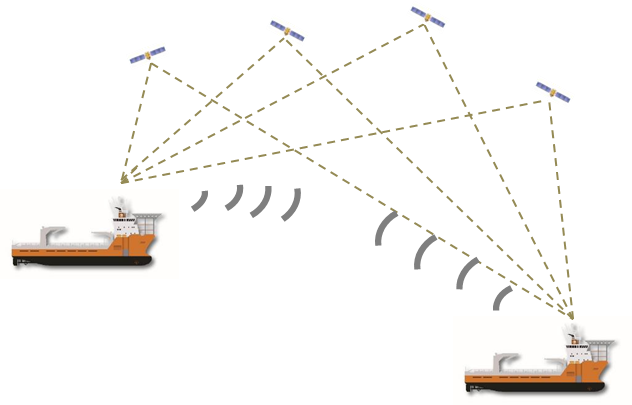 To provide the required relative position measurements, the project leverages EGNSS - in particular the accuracy offered by Galileo’s dual frequency and multi-constellation capacity. This will be augmented by data gathered from a variety of sensors, including IMU, AIS, LIDAR, RADAR, cameras and other proximity sensors. The project will also examine the possibility of using existing data from vessels, e.g. from load and stability systems. All this data will be integrated to get a comprehensive 3D model of the vessel's speed, direction, attitude and location relative to other vessels and objects in the area of operation, providing a high-integrity and resilient position solution. Sensor data, as well as 3D models, will be shared among the vessels that are involved in an operation. Commenting on the project’s expected impact, Project Coordinator Per Erik Kvam said that the H2H concept would provide mariners with crucial navigation information that will allow performing operations in closer proximity. “Operations that normally would not be permitted, or need to be aborted using present systems, can now be performed with H2H, which will increase operability accordingly. The system will be equally important for traditional operations with humans in the loop, as well as for more remote and autonomous operations,” he said. “By allowing vessels to share sensor data and 3D models, the H2H project also opens up numerous new applications, many of which might not be known today. Examples are wave prediction and controlling crane operations involving two moving objects,” Kvam said. If autonomous ships are to be approved for commercial use, they will need to be at least as safe as conventional vehicles performing similar functions. For vessels to operate safely, sensor data should be exchanged continuously. This will require an open standard, high speed, reliable communication link to securely exchange navigation data, capable of supporting relative positioning and the exchange of 3D models. To meet this requirement, Norway’s SINTEF Digital, one of the project partners, will analyse and propose a safe and secure communications overlay based on experience gained from, among other things, the offshore industry and rail. The communications solution will be an integral part of the H2H safety system. This is an important aspect of the project, as future regulations are likely to require that control and navigation systems for autonomous ships be certified in line with functional safety requirements. With this in mind, the project will also define a framework for safe hull-to-hull navigation and propose amendments to existing standards and regulations, thereby making a strategic contribution to the development of solutions towards a higher degree of autonomy in maritime navigation. The three-year project kicked-off with a meeting of the project partners at the GSA headquarters in Prague in December 2017. A first project workshop was held on 7- 9 May 2018 during Ocean Week in Trondheim, Norway. In addition to presenting the project at the Ocean Week Conference, the H2H partners participated in technical meetings to define user requirements for demonstrations of a pilot sensor package planned in Norway, the Netherlands and Belgium. The demonstration in Norway will feature autonomous vessels in simultaneous operations, while the one in the Netherlands will emphasise the auto-mooring aspect of an autonomous vessel, and the demonstration in Belgium will test the usability of the H2H EGNSS module for localization on inland waterways in various conditions. This work will be underpinned by dissemination and communication activities to support the process of adapting byelaws, standards, regulations and legislation for autonomous navigation. By leveraging EGNSS, the H2H project will open up new maritime applications, paving the way towards autonomous navigation in the shipping sector while simultaneously increasing the safety and reducing the cost of maritime operations.